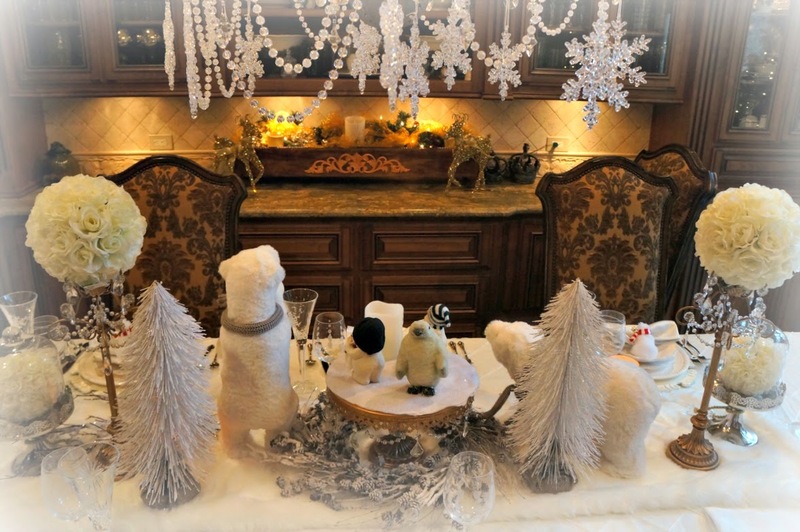 I am joining Kathleen from Cuisine Kathleen for her Christmas table challenge.I was going to change things up this year by decorating with some calming winter whites. My inspiration is from Dr. Christmas. Of course his table is over the top, but I wanted to something similar. I don't think having so trees so near to the chairs is a good idea, but it looks great! 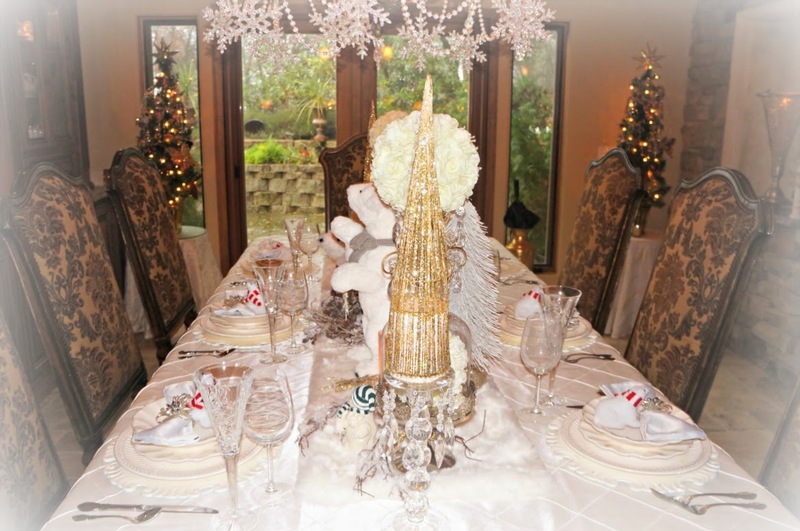 I am using a faux white fur runner for the table, along with a pretty white tablecloth. It would be great fun to sew some faux chair covers. I found the runner at Marshalls. 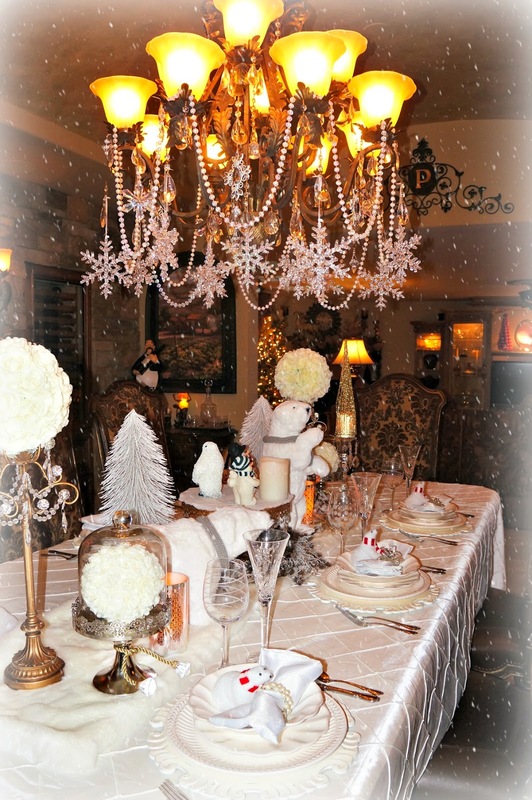 I decked the chandelier with white snow flakes and pearls. I love dressing our chandeliers. It's like icing on the cake. Some bottle brush Xmas trees, rose balls and pretty candle holders. I did also used all white dishware from Atelier. The chargers are from Pier1. I found the cute polar bears at one of my favorite stores, Pottery World. I waited for them to go on sale before purchasing. They also gave me a big discount for 1 eye missing. The swirl glasses are Mikasa and the snowflake flutes are Waterford. Our friends have given us two each for the last two Christmas seasons. I found the cute little polar bears at Big Lots. For added interest, I topped two of the candles with Christmas trees, which are hollow cones. Adding a snowy wreath for the woodsy look. I hope you are enjoying the holiday season. Take care and stay warm and cozy. Cheers! Be sure to visit the following blogs for some great inspiration. 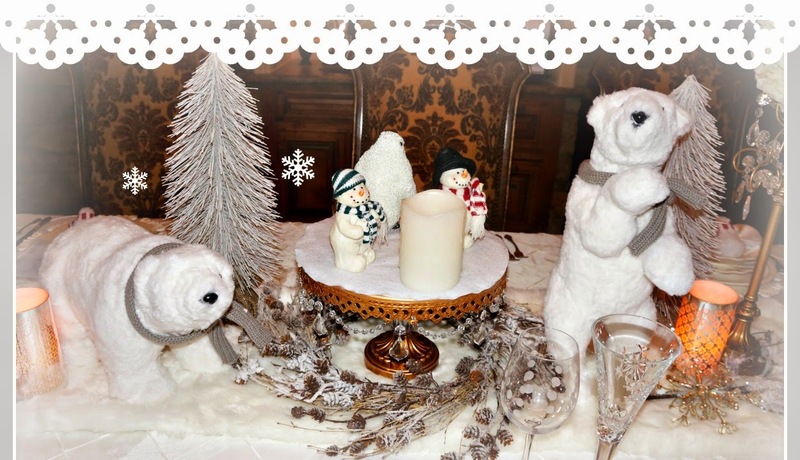 Be Inspired Features @ Elizabeth & Co.
What an adorable theme, Linda and I sure do love those polar bears! I wish that I could set up our tablescape,but it just will have to wait until a few days before Christmas. We don't have a separate dining room....ours in in our kitchen and I am setting up two tables and using our bar to seat 17 people. Can't have all that in the way, yet...LOL! Enjoy your dining with your guests....they will be thrilled! Beautiful table, Linda...you did a great job copying. I agree, those trees could be a problem being so close to chairs...at least in my house they would! 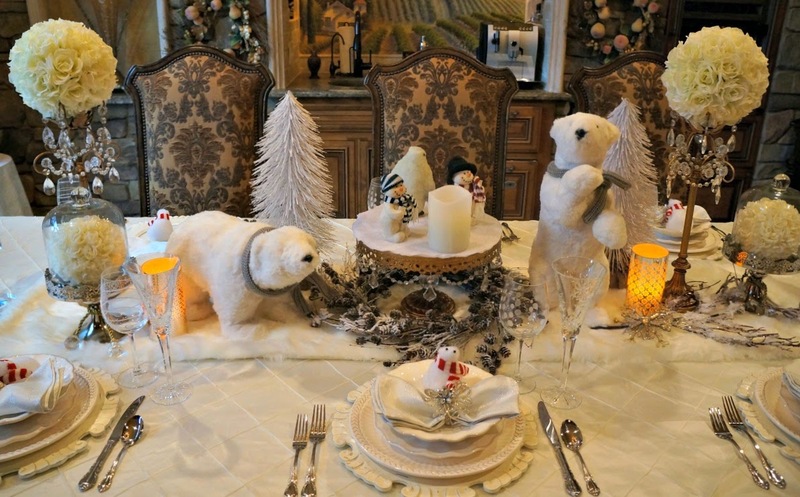 The centerpiece is awesome...that faux fur runner is so pretty and the polar bears look right at home on it. This is so elegant, and beautifully put together! Hi Linda! Oh, your table is simply gorgeous! I love all of the white and the little polar bears! Is that little dancing elf you? :) You're so cute. Hi LInda...I love your table and your entire dining room! So pretty! The polar bears are such a fabulous idea! Your inspiration table is amazing, but yours is much more inviting~ love the sparkling snowflakes and all white palette, just beautiful! What a pretty table! If I were in line next to you, I'd have been excited too...that tablecloth is really gorge. Pretty idea for the chandelier, making a mental note. Thanks for sharing! I love your table and the polar bears are so cute you did a fabulous job all together. Marry Christmas and Happy Holidays!!!! 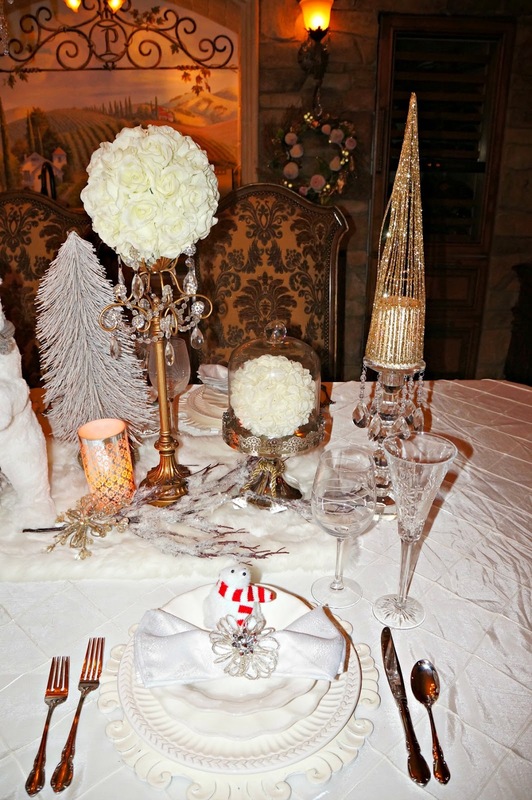 Linda, what a luxurious, wintry tablescape! 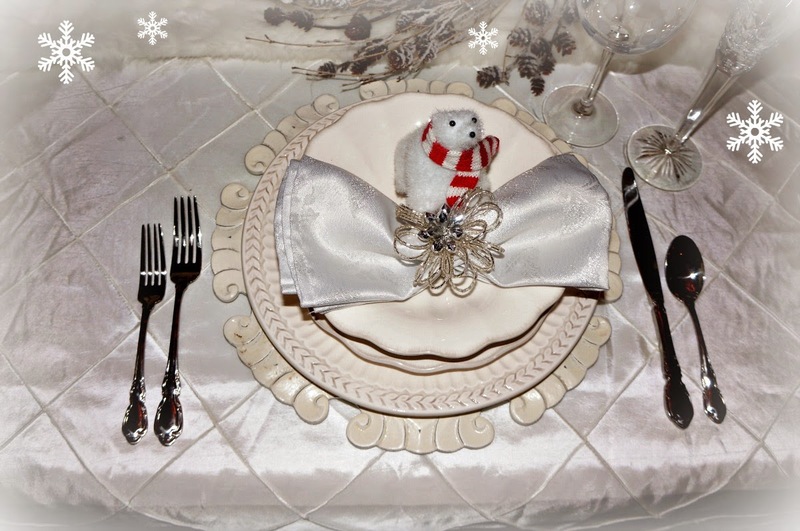 The fur runner, the winter white dishes, the snowy goblets and polar bears sure add the perfect touch. I love the pearls and snowflakes hanging from the chandelier, too. What a great copycat design you came up with!! Dr. Christmas' table is definitely over the top! I like your table! It is much more practical and totally delightful. Winter white ~ a favorite look! Bravo!!!! Linda, This table is just gorgeous!!! You and I are on the same page, Everything is snowflakes and ice for me this year. Now I want polar bears too!!! Of course I will need a fur runner too! And those Waterford flutes, I will need those too. Oh my!! I have a long shopping list of things I want after seeing this tablescape!!!. Gorgeous table, Linda! Every details is perfect and beautiful! Linda, how very clever and delightful. I would never have thought of this! Hi Linda, your table is gorgeous. 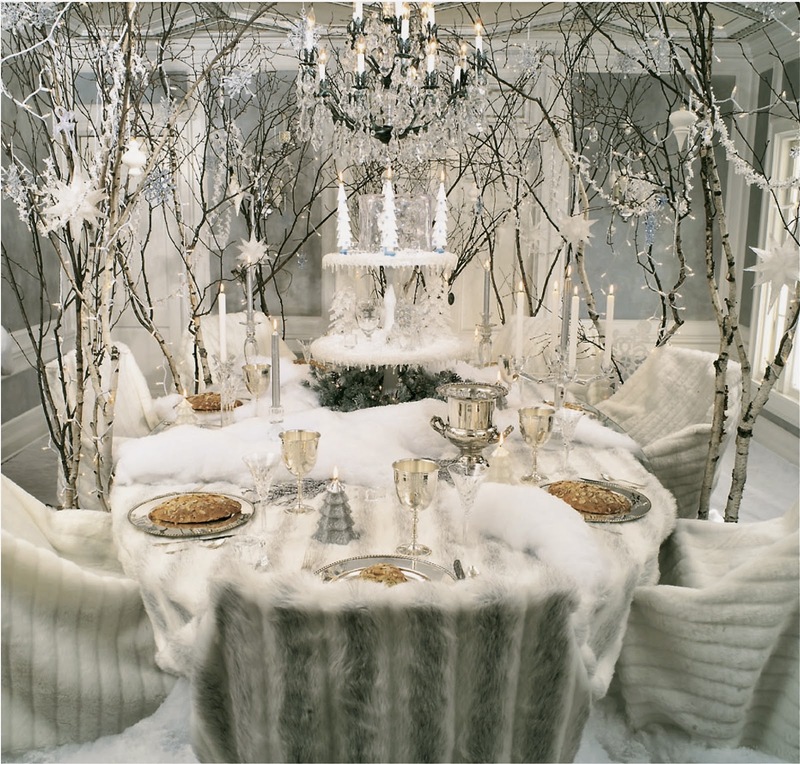 I love the snowy look and all the details going into creating this wonderland right on the table. What a cozy spot to enjoy a dinner with family and friends. You are incredible my friend. Love it and the take you gave to yours getting inspiration from Dr. Christmas. That one is awesome but I can't imagine actually dining there. Hugs for a great weekend! Oh wow I love your table, and those polar bears are absolutely adorable!! Great job!! Linda, so happy you joined in, and your table is just lovely! Love those cute little polar bears! Dr. Christmas is so over the top! Have a very Merry Christmas! YOUR table is gorgeous, as always! Love that faux fur runner too! The polar bears are adorable! You always do a beautiful table!!! Oh, wow, over the top!!! You did it again!!! Merry Christmas!! Your table is like a wonderland, magical as well as beautiful. Wonderful! 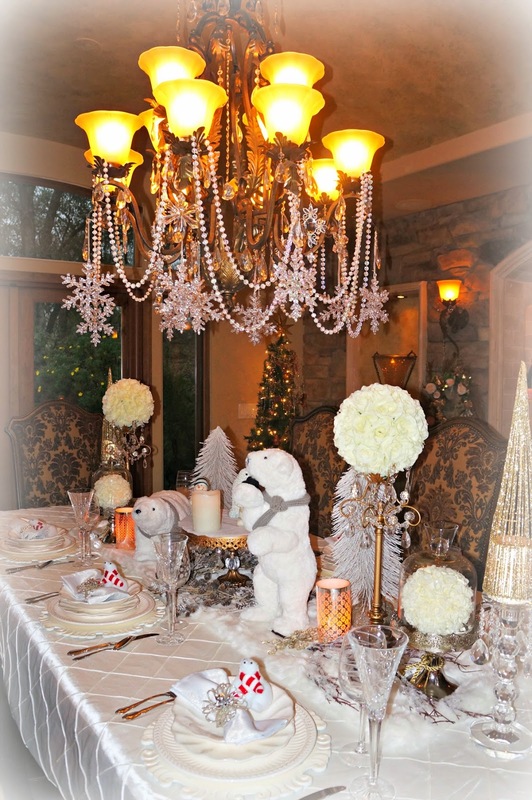 I love your table, polar bears and chandelier! I don't decorate my chandelier for Christmas. I guess I will have too. Love yours! Thanks. How absolutely fun. This is the season to create, laugh, dream, work as a team....to just play. LET'S PLAY! 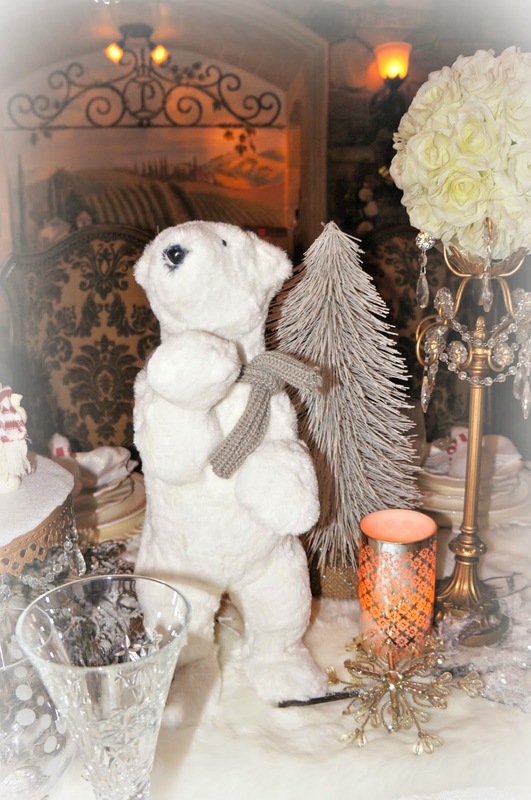 Polar bears are beyond cute:) And I love all the elegant touches! Thank you so much for joining the party ! Sooo elegant and fun! What a great idea to us the bears, adorable! Oh wow this is fabulous Linda! I literally just learned who Dr. Christmas is this evening on TLC! I love your version of his fantasy table! The white furry runner is so cool and I love the Polar Bears! The chandelier is gorgeous! You did a beautiful job decorating it! Love the all winter white design! This is wonderful, Linda! I love your polar bears...they are so cute! The chandy looks fantastic, dripping in snowflakes. You know, with that theme, you should only be able to serve chilled and iced dishes. An all-cold meal! A true winter wonder-ful-land, Linda! Cute polar bears! Linda, you are a pro in decorating and your tablescapes. This is just stunning! I love it much more than the Dr's...all those trees would give me claustrophobia. :) Your guests are going to LOVE this! nice you found those lil ones for each place, so cute. some friends sent us one, and they were hilarious ....as well. Blessings for a Merry Christmas Season, Hon! I love your table! I like it better than the one you copied, actually. Love the bears, big and little. A snowy wonderland! You always have so many pretty details on your tables, Linda! I love the polar bears! I bought some, too, and hope to be able to use them next year. I am DONE with this year's decorating. I hope you and your family have a wonderful Christmas and a fantastic New Year! WOW I'm speechless. There aren't enough adjectives to describe this tablescape.